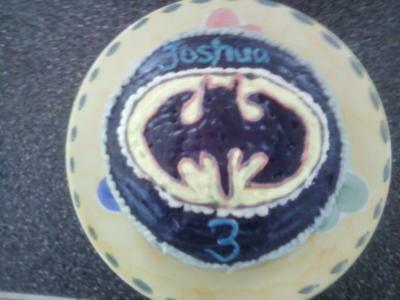 For this Batman cake, I found a Batman logo on the laptop, and hand drew it onto the cake icing using a toothpick. Then filled the image in using butter icing colored with regular black and yellow food colorings. I outlined it with edible icing pens. YOUR CAKE IS SO CUTE AND LOOKS GOOD ENOUGH TO EAT. LOL I'M SURE THEY LOVED IT!!! !